The way in which art mediums tell stories will be on display at The Spiral Gallery this month. "What's Your Story?" features pottery by Michael Berkley and weavings by Rory Mutton. It hangs through the end of July at the gallery at 341 Broadway St. Both artists enjoy working in mediums that highlight stories from the past and present. "We both do ancient crafts," Mutton said. "Weaving, like pottery, tells different stories and sheds light as to how our ancestors perceived the world during their time. Patterns, choices of materials and the artist reflect different environments and cultures," Berkley added. Several of Mutton's pieces in the show are horoscope scarves, which feature personalized patterns based on a person's date, time and place of birth. "Each one is different," she said, noting that the "What's Your Story?" show includes horoscope scarves for her mother and daughter. Mutton likes creating the scarves because "they're something you can use every day." Berkley's pieces in the show include pottery with text from various stories carved into them — also known as story vessels. He noted that the featured text ranges from world prayers to stories from individuals and the words are "from the heart, environmental and political." "(People) commission me to write their story, or a story for a loved one," he added. Berkley noted that the process of creating the vessels reflects the story of one of his goals. "There are no glazes when pit firing," he said. "And no matter how much you think you know or how much experience you have, once you light that fire, it's pretty much out of your hands.We are all practicing the art of letting go in our lives." Though there are many differences between the two mediums, both artists enjoy seeing them displayed together in the "What's Your Story?" show. Mutton appreciates the way in which the pottery and weaving pieces complement one another. "There are both hard surfaces and soft surfaces, and there's lots of texture and color," she said. 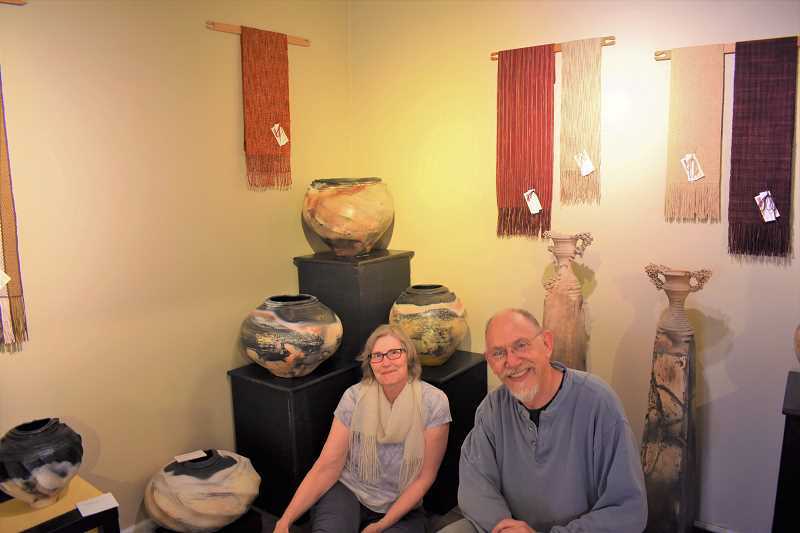 "We enjoy using our hand(s) and bringing our part to each of these mediums," Berkley said.